The idea of an adequate standard of living is fundamental because it sums up both the legal and moral obligation to do something about poverty. It can be surprising to realize that there are legal obligations to take steps to end poverty, but international law has clear requirements about what states (governments) are expected to do. 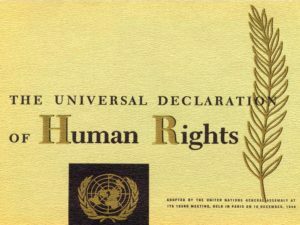 Human rights are a relatively new idea that emerged in international law after WWII; the Universal Declaration of Human Rights (UDHR) was the first exclusively “human rights” document at the international level. It has since been followed up with several major legal documents that focus on protecting different areas of human rights. One of the core aspects of human rights is the principle of non-discrimination, which means that everyone possesses the same rights regardless of who they are, where they are from, their income, or other such factors. International human rights law dictates quite clearly that poverty is a violation of several human rights, including the right to an adequate standard of living which encompasses the rights to food, clothing, health, housing, medical care and social security. The International Bill of Human Rights is made up of the UDHR, the International Covenant on Civil and Political Rights (ICCPR), and the International Covenant on Economic, Social, and Cultural Rights (ICESCR). Together, they are the most fundamental legal instruments for detailing and protecting human rights at the international level.